Henry and Servilla: Or, The Death Bridal, Being a Graphic Account of the New Boston Tragedy. [New Boston, NH, 1854]. 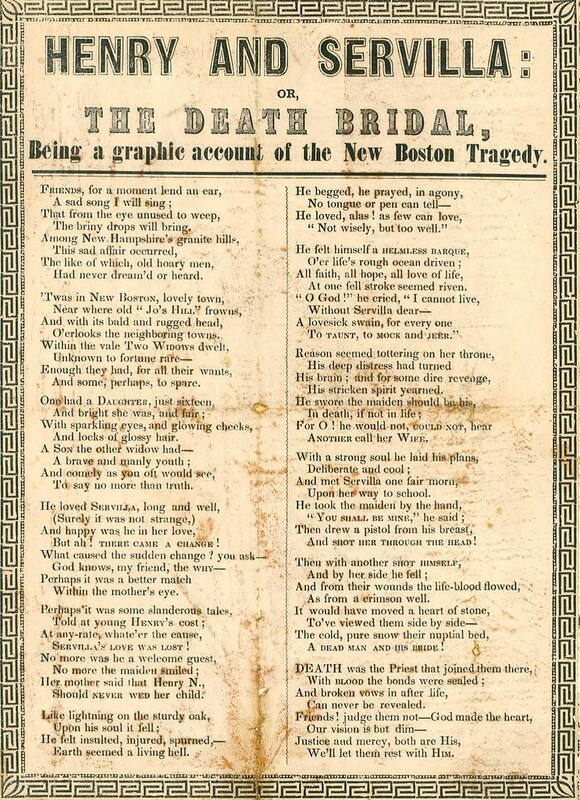 The Yale Collection of American Literature has acquired a rare and unusual 19th century poetry broadside documenting an 1854 murder-suicide in New Boston, New Hampshire; on January 11, 1854, after being rejected by Servilla Jones, Henry N. Sargent fatally shot the young woman before shooting himself. The event was reported in the New York Times on January 19, 1854 (“The New Boston Tragedy”). Other recently acquired materials can be located by searching the Library’s Uncataloged Acquisitions Database; new and unusal collection materials are regularly featured at the Room 26 Cabinet of Curiosities blog.